Eyca sketches her ideas then throws them on the wheel, trims, combines, decorates, bisque fires, glazes, and glaze fires at 2400 degrees. Her functional pieces are safe and durable and can be used in the oven, microwave and dishwasher. Self taught, she has learned to incorporate glass in the pottery. Her sculptural pieces, which have to be seen to appreciate the detail and complexity, often feature three dimensional images of creatures floating in a colorful sea. 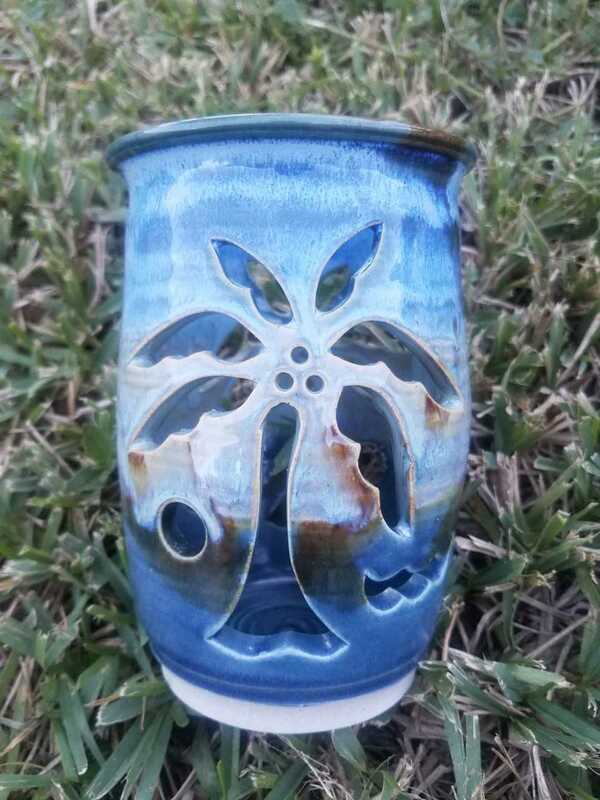 One of Eyca’s ceramic candle holders with a carved palm tree motif will be the prize in the Studio’s monthly giveaway. To enter this free drawing, visit the Studios any day in October.